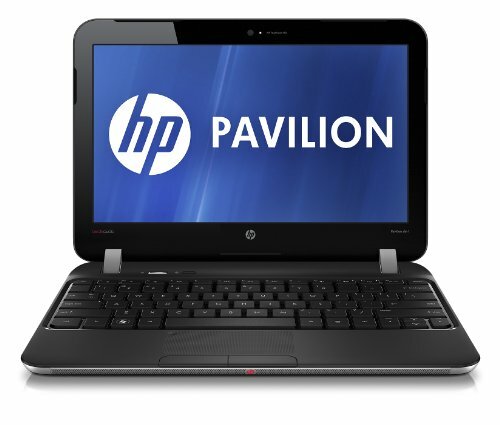 Below is our review of the HP Pavilion DM1-4300SA, a 11.6" laptop, featuring 4GB RAM, 500GB hard drive and Windows 8. The Pavilion DM1-4300SA from HP is a small 11.6" budget notebook aimed at the lower end of the market, offering great portability and computing whilst out and about. Finished in an unusual design, with a black textured lid surrounded by silver rounded side panels, it certainly stands out from the crowd. Upon opening the notebook you are faced with a keyboard spanning the width of the case, with a centre based touchpad. As with most smaller laptops, the DM1-4300SA doesn't feature a number pad, simply as there isn't room to fit one, without making the keys smaller to accommodate it. The keyboard is comfortable to use despite the overall size of the laptop, and although the screen is fairly small, this laptop does have HDMI output, enabling you to watch films on an external monitor or TV if required. The processor is by AMD - a Dual-Core E2-1800 1.7GHz Processor, which is backed up by 4GB RAM, and a 500GB hard drive operating at 5400rpm - all pretty good considering the overall cost of this notebook. In terms of connectivity this laptop features the aforementioned HDMI port, 3 USB ports, VGA, Ethernet, Microphone and headphone, card reader, but no DVD drive - the result of which is saving weight, which is handy if you're planning on travelling with this notebook. The screen is 11.6" and offers a decent picture for it's size. Surrounded by a thick black bezel, and sitting underneath the built in webcam, it gave a crisp picture and displayed colours accurately. In terms of size the Pavilion DM1-4300SA measures 21.5cm by 29.2cm by 3.2 cm and weighs a pretty competitive 1.6 Kg - so light enough to fly with. Windows 8 is the installed operating system, which loaded fast and was pretty reliable during the test period. This will be standard for the vast majority of new laptops, with only older laptop models still being shipped with Windows 7. So who is this laptop aimed at? At a relatively low price, and the fact it's light and small make this notebook ideal for those who travel a lot - whether the daily commute or flying around the world. It may be a touch small to be able to work in front of for long periods of time, but it is perfectly functional for every day computing usage. Cons: Screen is small, perhaps too small to work in front of for longer periods of time. After a cheap laptop for travelling? The HP Pavilion DM1-4300SA is a good choice.